Midterm elections in the USA are so called because they refer to the elections for federal offices that typically demarcate the middle of a presidential term. Historically, these elections draw lower voter turnout than presidential elections, but can serve as powerful referendum votes on a sitting president’s performance. Despite receiving nearly 3 million fewer votes than his opponent Hillary Clinton and with more than half of Americans rating him negatively, President Trump’s numbers are stable, but reflect deeply polarised political views. Both parties hope to take advantage of the partisan divide by aggressively campaigning and mobilising voters in the most contested state midterm elections—with congressional control at stake. Recent polls and media coverage indicate that health care is emerging as the key determining issue in many races. Other health-related issues, including gun control, immigration, and the environment, will feature prominently. The midterm elections, taking place on Nov 6, 2018, will encompass 435 seats of the US House of Representatives, about a third of full-term US Senate seats, 34 of the 50 states’ gubernatorial races, and several pivotal special elections and ballot measures across the country. 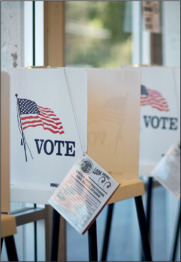 This year’s midterm elections will put a wide range of health policy proposals to voters. Florida, Maine, Idaho, and Utah will decide whether to expand Medicaid. Other notable votes will take place on a policy amendment in Alabama that would eliminate any state funding or provision of abortion, a sales tax exemption on feminine hygiene products in Nevada, and, in Massachusetts, an anti-discrimination veto that would roll back transgender equality legislation passed in 2016. Within the present political gridlock, state-level ballot measures have taken on increasing importance during midterm elections. Even with a congressional majority, Republicans have been unable to achieve much of their agenda through congressional legislation, with the exception of a sweeping tax overhaul. Previous attempts during 2017 to dismantle the Patient Protection and Affordable Care Act (ACA) faced unanimous rejection from Democrats and failed to get sufficient Republican traction in Congress. As a result, opponents of the ACA have shifted tactics to undermine some of the health law’s signature provisions. Using strategically placed lawsuits in district courts, the Trump administration has attempted to challenge the constitutionality of the individual mandate (ie, requirement that all Americans must have basic health insurance) and pre-existing condition coverage. With two Supreme Court openings in the past 2 years, the administration has also had the opportunity to appoint conservative Neil Gorsuch to the country’s highest legal jurisdiction and will likely confirm a second, Brett Kavanaugh, prior to the midterm elections. A right-leaning US Supreme Court could have profound implications for legislation stemming from ACA challenges to the potential revisit of Roe v Wade, the landmark 1973 decision to disallow federal restrictions on abortion. Lawmakers who prevail after the midterm elections will immediately be faced with other urgent health-related issues affecting the nation. Candidates in both parties have been pressed by voters on where they stand on critical issues including the rising cost of health care, especially insurance premiums, drug pricing, and efforts to curtail the opioid epidemic. Preliminary data from the US Centers for Disease Control and Prevention indicate that the number of deaths has edged upward, with nearly 72 000 owing to overdoses in 2017. While there have been modest bipartisan efforts, including a flurry of bills targeting opioid abuse, proposed legislation has largely neglected how to provide more treatment without dramatically increasing federal spending, an unlikely scenario given Republican opposition to Medicaid expansion or alternative funding. Similarly, bipartisan-sponsored plans to rein in drug price hikes, such as the FAIR Drug Pricing Act, which would require notification of price increases over 10%, will face strong resistance from drug makers, the largest lobbying group in the USA. As the country anticipates the results of the 2018 midterm elections, the media have argued whether a “blue wave” or a Democratic surge will dominate local and special elections in response to dissatisfaction with the Trump administration and Congress. Over 500 women candidates have registered for congressional races, a record number, and two-thirds are Democrats. 80% of women candidates are campaigning around core issues of health care, education, and reproductive health. With engagement on both ends of the political spectrum escalating, in the lead up to November, the debate around American health will surely continue to be front and centre. I’m running for Congress, just won the Primary in our district. Unlike many who have said they would, after 10 years of watching the VA be fleeced by the Pharmaceuticals, resulting in cuts to Veteran services I WILL take on the Pharmaceuticals after election.